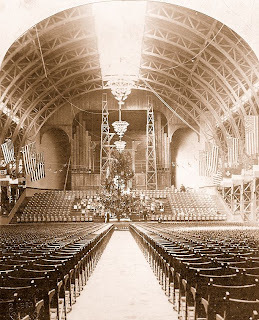 Despite getting off to a less than successful start, the World's Industrial and Cotton Centennial Exposition celebrated Christmas Day, 1884, with a great gathering inside Music Hall. 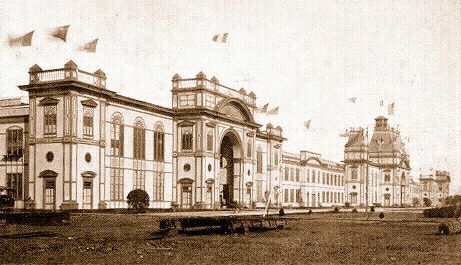 The day's festivities, organized by Mrs. Sue Burke, wife of the Director-General, began with the Mexican band playing Christmas songs, as a large crowd assembled in the vast auditorium. On the hall's stage stood an immense hemlock tree, forty-five feet in height, sent from Connecticut. The tree was decorated with scores of beautiful gifts and lit with multi-colored electric lightbulbs, provided by the Edison Electric Co. The Christmas Day celebration was dedicated to the children of New Orleans, of which hundreds filled the audience. Santa Claus was also in attendance, portrayed by the Honorable T.R. Pickering, Commissioner of the State of Connecticut. 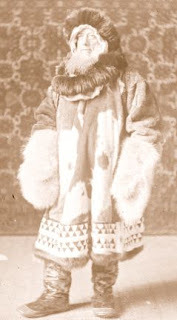 He was dressed in a Siberian seal and reindeer skin garment, with Siberian sable boa, hood, gauntlets, and boots to match. This outfit was a relic of the Greely relief expedition, and had originally been purchased in Russia. Santa Claus presented the many gifts, which filled the tree, to the children in attendance. A long line was assembled, and hundreds of dolls, watches, clocks, jumping-jacks, fiddles, drums, horns, baskets, stuffed-toys, candies, and many other trinkets & gifts were handed-out to the happy and excited young people. As the Christmas ceremonies came to a close, many visitors strolled outside to view the multitude of fruits and vegetables on display in Horticultural Hall, which glowed like a massive glow-worm from the many electric lights inside.